A pair of new Zodiac Time Beast that support bind zone mechanics. ACT [Bind Zone] [Soul Blast 1] Call this card to (RC). AUTO Generation Break 1 [Counter Blast 1] When this card is put into your bind zone face up, you may pay the cost. If you do, draw a card. 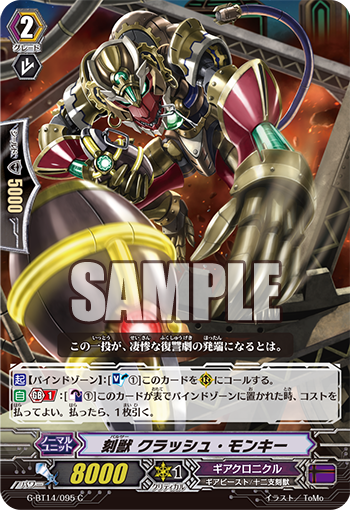 AUTO Generation Break 1 [Soul Blast 1, choose one of your other <Zodiac Time Beast> rear-guards, and bind it face up] When this card is placed on (RC), you may pay the cost. If you do, draw a card, and Soul Charge 1.